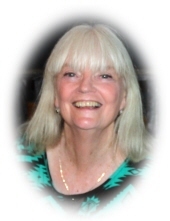 Mrs. Mary Lou Houge Herriott, age 73, of Carrollton, Georgia died, alongside her husband, Thursday, April 12, 2018. Mrs. Herriott was born in Memphis, Tennessee on August 11, 1944, the daughter of the late Alvin Lee Hogue and Grace Charlotte Lyons Hogue. She was a homemaker, an avid horse lover, and a member of Midway Church. Survivors include her daughter, Robin Marie Moreland of Harrogate, England; sons, Robert Paul Herriott, Jr. of Princeton Junction, New Jersey and Darren Robert Herriott of Carrollton; grandchildren, Addison Herriott, Glenn Moreland, Connor Herriott, Benjamin Herriott, Sydney Herriott and Ethan Herriott; brother, William Allen Broughton; sisters, Margaret Katherine Wilkins, Linda Broughton Barr, and Kay Broughton Jones. Along with her parents, she was preceded in death by her brothers, Charles Richard Martin, Joseph Fredrick Broughton. She was also preceded in death by Mary Edith Martin Broughton. A Celebration of Life Service will be held Wednesday, April 25, 2018 at 2 P.M. at Midway Church with Pastor Todd Wright officiating. There will be a reception in the fellowship hall following the service. Inurnment will be in the Barrancas National Cemetery in Pensacola, Florida. "Email Address" would like to share the life celebration of Mary Lou Houge Herriott. Click on the "link" to go to share a favorite memory or leave a condolence message for the family.